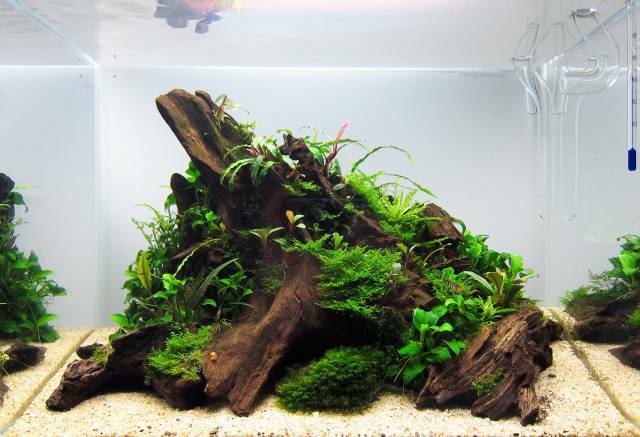 Creating a great-looking aquascape is not all that difficult. There are three basic forms for the arrangement of plants and decorative materials (hardscape) in a layout, which guarantee a well-balanced, beautiful appearance. These forms are the basis for setting up an aquascape. In this basic form, the hardscape and the plants decrease in height towards one side (from left to right or vice versa). Please remember to keep a free line of sight to the back glass of the aquarium at the foot of the triangle to create a good sense depth. As its name says, in the central form all the layout elements are arranged in the centre of the tank. Plants and decoration almost look like a hill. Do not arrange everything absolutely in the middle, though, to prevent the layout from looking too symmetrical and too straight. This would give your design a highly unnatural appearance. Move the hill slightly towards one side, and keep the sides of the aquarium empty to provide an unobstructed view of the aquarium back, which brings about a stronger sense of three-dimensionality. This basic form is often called the convex form. This layout concept is often called concave form, and it is very popular. You have towering decorative material on both sides, but with a kind of valley in the middle. Often this valley is used for depicting a river or a gorge. For symmetrical reasons, this valley is never created in the very centre of the layout but leans more towards one side. All these basic forms serve to create a natural appearance. Avoid aquascapes that look artificial or too constructed. The golden section is very helpful for doing so, as is working with negative spaces, or free spaces. If you keep to the basic forms we present here the latter requirement is already met, at least partially.